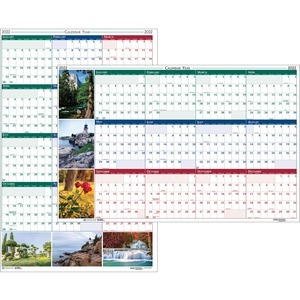 Laminated wall calendar offers 12 months of planning and three full-color nature scenes on both sides. One side has a vertical format, and the other side has a horizontal format. Both sides have a write-on/wipe-off surface, unruled daily blocks (1-1/8"" x 1-3/8""), and colorful images. Dated planning ranges 12 months from January to December. Wall calendar includes self-adhesive hangers and a water-soluble marker. Paper is made with a high percentage of recycled material and printed with soy ink.